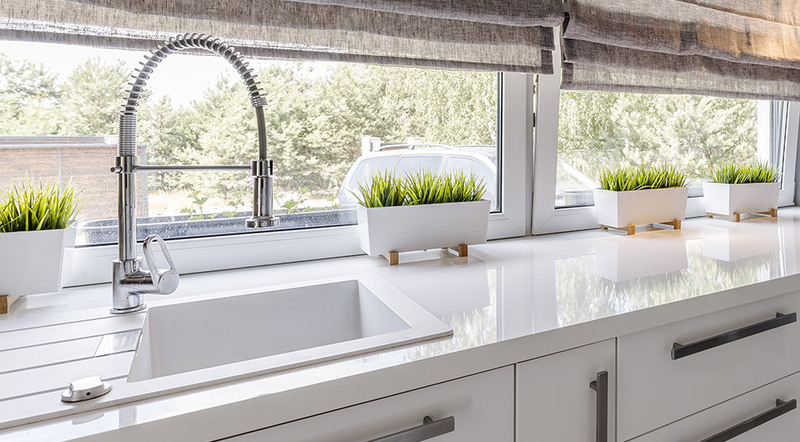 As one of the most important and used fixtures in the kitchen, your kitchen sink should provide the function, style, and durability you need to make cooking and cleaning in your home a breeze. Gone are the days of limited options and exclusively double-basin sinks – Manufacturers have created thousands of varieties of sinks in different colors, styles, and features. 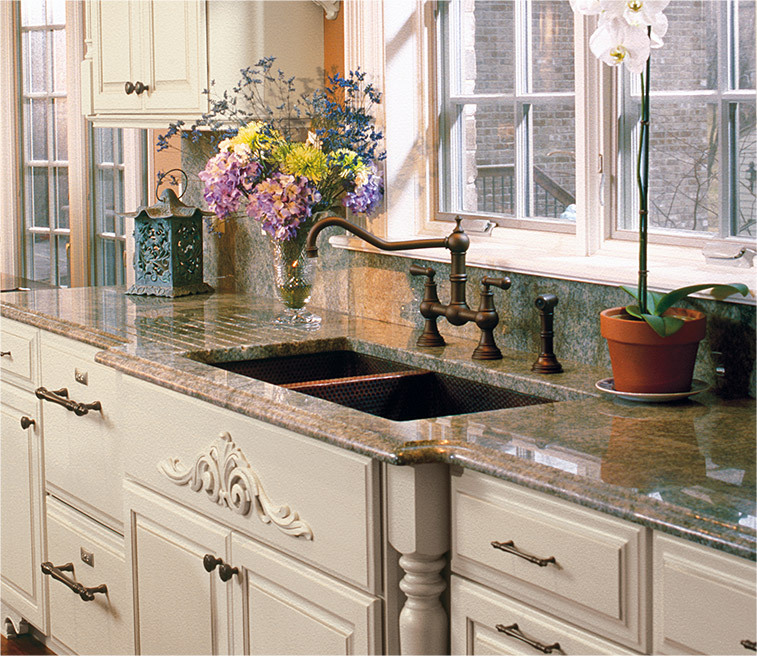 For a rustic, country kitchen, farmhouse sinks’ exposed front panel delivers an eye-catching look. For busy family homes, a multi-basin sink provides the necessary separation for your garbage disposal, clean, and dirty dishes. 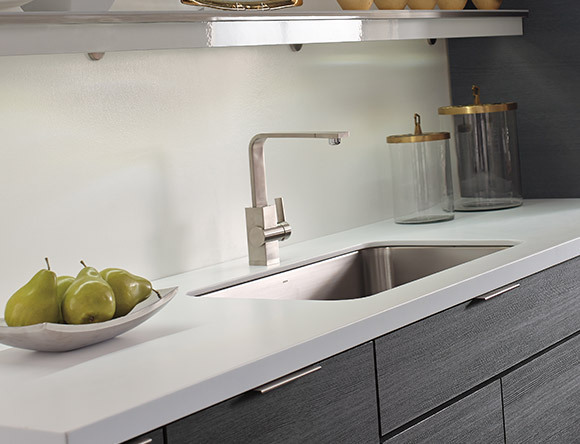 For an elegant, modern kitchen, the undermount sink’s clean lines blend seamlessly in with contemporary design. When choosing your kitchen sink, you should first consider the size of your kitchen. 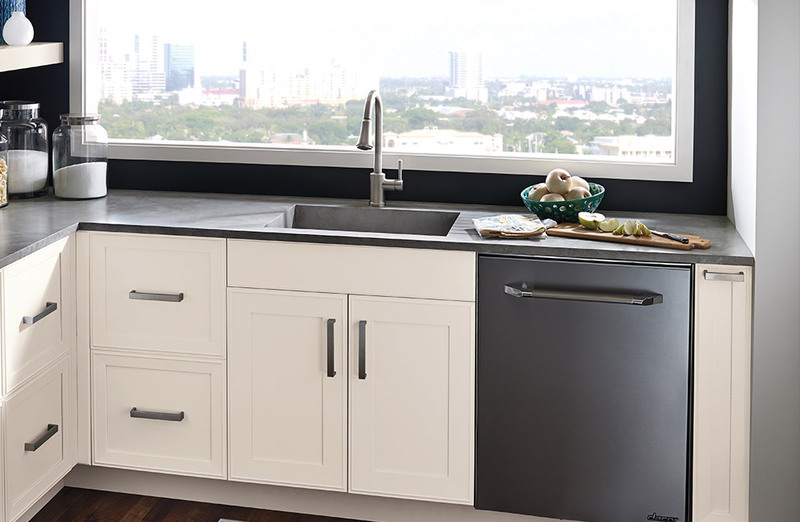 In apartment or secondary kitchens where space is a premium, a smaller bar sink could be the perfect compromise in providing enough room for washing dishes while also preserving as much counterspace as possible. On the other hand, large family homes that need bigger bowls and space for communal cooking and cleaning are better suited for multi-basin, farmhouse or standard kitchen sinks. Next, you will need to decide what style best matches your kitchen and home’s aesthetic. While traditionally a country kitchen look, farmhouse sinks have grown in popularity and now come in a variety of finishes to seamlessly blend into any kitchen’s style. For an easy to clean, minimal look, undermount sinks offer an unbroken flow from the countertop into the sink. 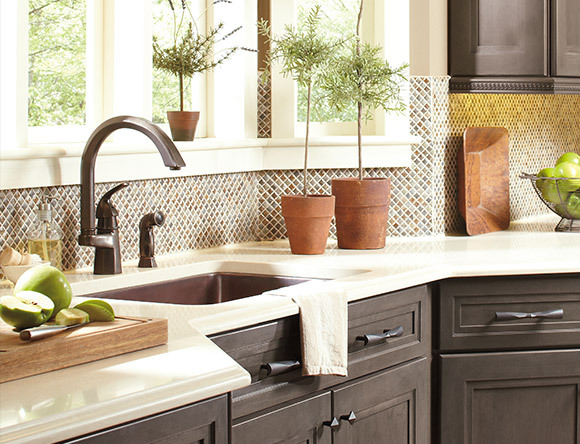 While these are two of the current most popular sink styles, there are many options to choose from when creating your dream kitchen. Finally, after deciding the size and style of your sink, you should pick the material that best matches the design of your home. Kitchen sinks come in an endless variety of colors and finishes including stainless steel, white, black, and brass to name a few. For a timeless look, consider choosing a white or stainless-steel sink, but if you want a sink with personality that pops, take a look at more impactful colors like gold or copper tones. Your kitchen sink should be functional, sturdy, and complement the style of your space because it is one of the most important and used fixtures in your kitchen. 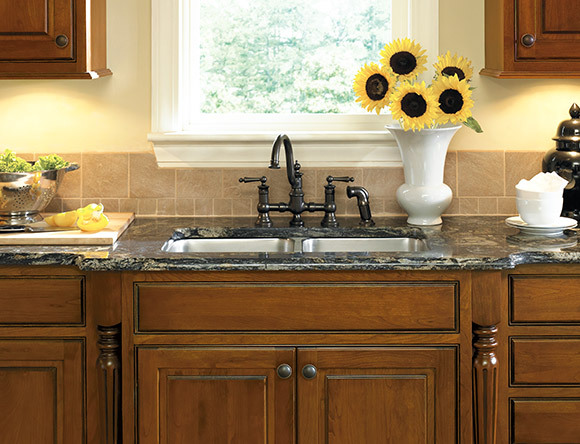 Henry Kitchen & Bath has thousands of sink styles, materials, and colors from industry leaders like Elkay and Barclay, so you can find the perfect kitchen for your family’s home. 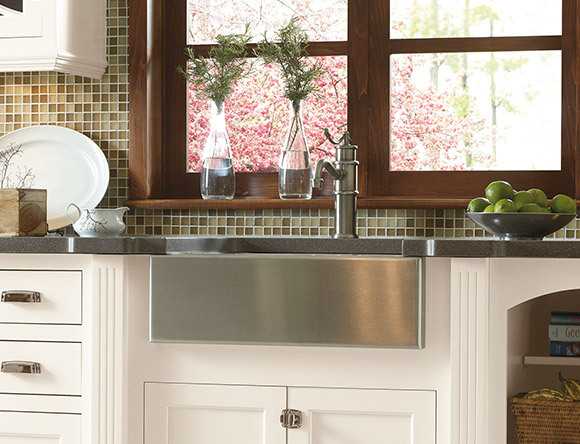 Bar sinks provide equal parts function and style to help improve your kitchen’s flow. While bar sinks are primarily used in separate bar areas for convenient washing and rinsing of glasses, they can be installed for a wide variety of reasons. In large family kitchens, a secondary bar sink can help alleviate congestion by providing another area for food prep and washing hands. In secondary or smaller kitchens that are limited by space, a bar sink is the perfect compromise between room for washing and room for counterspace. No matter what you use your bar sink for, the smaller footprint gives you the freedom to choose a bolder look for your sink while still maintaining your kitchen’s overall design style. Before dishwashers, double-basin sinks were the standard in kitchen sink design with one compartment filled with soapy water for washing dirty dishes while the other compartment remained empty for rinsing the cleaned dishes. While dishwashers have eliminated the necessity for two basins, multi-basin sinks are still a great option for busy family homes where multiple people use the kitchen on a daily basis. They are also useful for people that frequently use their garbage disposals because they ensure you will always have access to your disposal even if one basin is filled with dirty dishes. With many functional benefits and a stylish open-front look, farmhouse sinks have become an increasingly popular option in today’s kitchen designs. The deep single basin makes washing pots and pans easily and painless by eliminating any water splashing out onto you or your countertops. Due to its rise in popularity, there is now a wide range of colors, materials, and styles of farmhouse sinks to suit any kitchen’s aesthetic. If you are considering a farmhouse sink for your kitchen, make sure you talk to one of our experienced designers because these sinks require a special lower cabinet and proper installation. Drop-in sinks, as the name suggests, are installed by placing to sink down into the designated area so that the edges or lip of the sink rest on top of the countertop for increased support and stability. The easy installation and replacement process make drop-in sinks not only one of the most popular sink options but also the cheapest. If you are remodeling or renovating on a budget, a drop-in sink in a color and style that matches your kitchen’s look is the perfect option. For homeowners wanting a clean, sleek look, an undermount sink is a great choice. Unlike drop-in sinks that are placed down into the sink space, undermount sinks are installed by raising the sink from underneath the countertop and securing it from below. Because undermount sinks have no lip resting on the countertop, they provide a continuous flow from the countertop into the sink that makes cleaning up and wiping food scraps into the garbage disposal easy. 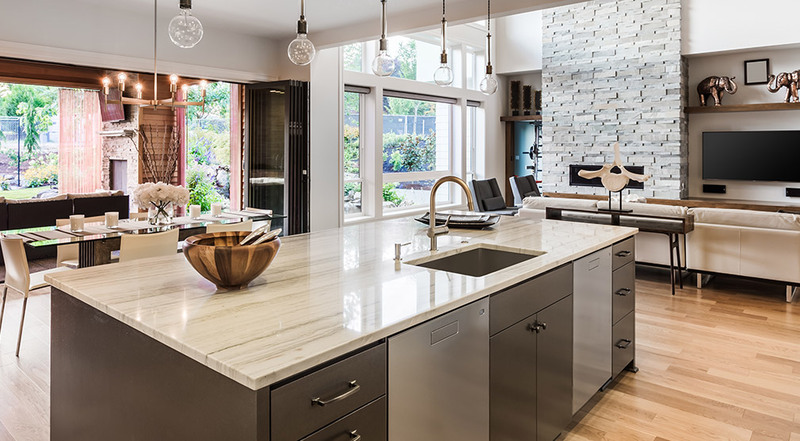 Undermount sinks are the perfect addition to a contemporary kitchen. 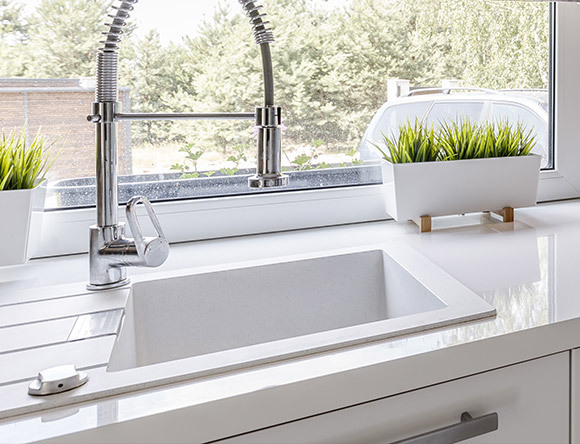 Your kitchen sink will be one of your family’s most used kitchen fixtures, so hiring experienced professionals is crucial for a properly installed, functional sink your family will love to use for years to come. With thousands of sink options on the market, narrowing down your selection can be an overwhelming and daunting task, but the experts at Henry Kitchen & Bath are here to help you! Our designers will work with your needs and personal style to help you choose and install the kitchen sink of your dreams. 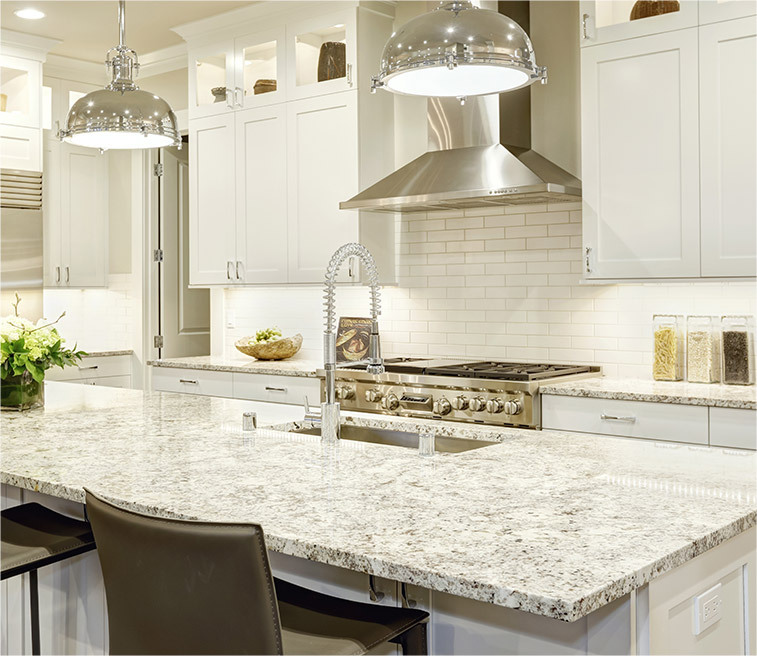 Choose Henry Kitchen & Bath for your next kitchen remodeling or renovation project – We can make your dreams a reality!